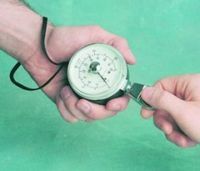 This Pinch Gauge\'s unique design frees the client to perform a true pinch pattern because the therapist, not the client, supports the weight of the gauge. Red indicator remains at maximum reading until reset. A highly accurate pinch-force measurement, devoid of artifact, is the result. Measures pinch force up to 45 lbs. Includes instructions and handy carrying case. Warranty: 2-year warranty. Rubber gauge cap contains latex.